The founders of both Anarchism and Marxism all came out of the dissolution of the Young Hegelians in the 1840s, during the revolutionary upheavals that swept across Europe and destroyed the “Old Order”. Both Mikhail Bakunin and Frederick Engels were present at the December 1841 lecture by Friedrich Schelling denouncing Hegel, representing two of the plethora of radical currents that sprung out of that conjuncture. Also with their roots in the Young Hegelians were Max Stirner, a founder of libertarian individualism, one of the targets of Marx’s The Holy Family, Proudhon, the founder of theoretical anarchism and Bakunin’s teacher. The writings of Blanqui are currently being made available in English for the first time in the M.I.A. Reference Archive. Despite spending most of his adult life in French prisons, Blanqui was a hero of the French working class and was elected President of the Paris Commune in 1871. The government refused to allow Blanqui to take up his position. Blanqui is more a communist rather than an anarchist and yet he is a precursor of both. His policy was for the formation of secret armed detachments of workers for the purpose of seizing political power, smashing the forces of the bourgeoisie and implementing socialism. His long years in jail were the result of his repeated attempts to put theory into practice. His heroism, honesty and charisma earned him the respect of Marx and Proudhon alike, and Mikhail Bakunin was a supporter of Blanqui in his early years. Blanqui is the forerunner of the “urban guerillas” of the 1960s as well as the “militant” anarchists in the anti-WTO movement. From the 1860s onwards, Anarchists and Communists alike rejected Blanqui’s “conspiratorial” strategy, though ironically it has forever after remained the bourgeoisie’s stereotype of radicalism. Proudhon was the first the attempt to use Hegelian ideas to make a radical critique of political economy. This work is first set out in What is Property? (1840) but his most famous work is The Philosophy of Poverty (1847), the subject of Marx’s famous Poverty of Philosophy. Proudhon’s ideas were probably the most influential current among the participants in the Paris Commune of 1871. Proudhon’s ideas are at the root of that type of anarchism which envisages a world of small-scale producers living in self-sufficient, sustainable communities using local systems of exchange. It is often called “petit-bourgeois anarchism” because its ideal is the self-sufficient independent proprietor, and appeals to the self-employed tadesperson or small business person in capitalist society whose hatred is directed against big capital. 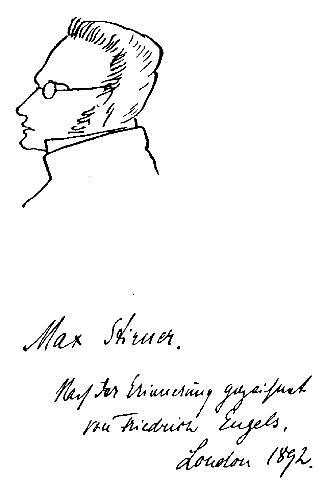 Max Stirner was one of the Young Hegelians blasted by Marx as “Saint Max” in Chapter 3 of The German Ideology (1845). We do not have any works by Max Stirner on M.I.A. at the moment, but Stirner’s major work, The Ego and Its Own, and other works are available from The Egoist Archive. Stirner was also a Young Hegelian, but returned to the philosophy of Hegel’s predecessor, Johann Fichte. Stirner advocates egoism, an extreme form of Libertarianism which idolises individualism and rejects any and all forms of collectivism. Thus, in contrast to the communal spirit of Proudhon’s philosophy, Stirner is the precursor of Autonomism. Shades of Stirner are also visible in Nietzsche. 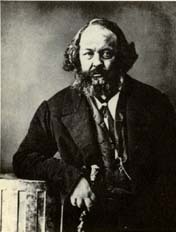 Bakunin was won over to socialism by the influence of Blanqui, and Bakunin was notorious for his propensity to form secret organisations fomenting rebellion. Bakunin regarded Proudhon however as his foremost teacher and recognised Proudhon as the founder of anarchism. In 1866, Bakunin joined the International Workingmen’s Association and built up an anarchist wing within the International, along with James Guillaume, Errico Malatesta and others. After the defeat of the Paris Commune in 1871, a reaction set in in Europe. Bakunin was expelled from the International at the Hague Congress in 1872, and his influence declined after this time and he died in 1876. Marx & Engels’ Writings on Bakunin. Guillaume was Bakunin’s closest comrade, a member of the International Workingmen’s Association, the main chronicler of Bakunin’s life and work and later also a founder of the Anarcho-Syndicalist movement in the early 20th century. See his Ideas on Social Organisation (1876) for a summary of the ideas of the nineteenth century anarchist movement. And see The Necessity and Bases for an Accord, a response to the rise of mass programmatic socialism aspiring to state power, on one side and the terminal insanity of “bomb-throwing” anarchism on the other, by Saverio Merlino, 1892. See also, the Italian Anarchist: Errico Malatesta, (1853-1932), a member of the First International from 1871. Among the Russian Anarchists, see Peter Kropotkin (1842-1921), the Anarchist-terrorist, Sergey Nechayev (1847-1882), author of the Revolutionary Catechism. Ravachol and Emile Henry were among the “bomb-throwing anarchists” of pre-World War I France, alluded to, for example, in Emile Zola’s Germinale and in Victor Serge’s memoirs. See also Archives of Octave Mirbeau (1848-1917), Léo Taxil (1854-1907), Sebastien Faure (1858-1942), Emile Pouget (1860-1931), Fernando Tarrida del Marmol (1862-1915), Georges Darien (1862-1921), Zo d’Axa (1864-1930), Georges Etiévant (1865-), Emile Armand (1872-1963), Manuel Devaldes (1875-1956), Emile Henry (1872-1894), Libertad (1875-1908), Marius Jacob (1879-1954), Elisée Reclus (1830-1905), Paraf-Javal, Jules Méline and Andre Lorulot (1885-1963), Noël Demeure (1906), The Bandit of the North (1890), Henry Poulaille (1896-1980), Louis-Ferdinand Céline (1894-1961), Mauricius (1910) and Letter from a Conscript. Anarchy and Comunism, Carlos Cafiero 1880. See On the Anarchists, Jean Jaurès 1894. An Anarchist Joins the Communists, Erich Mühsam 1919. Is the Anarchist Ideal Realizable?, La Revue Anarchiste, Dec 1929, Jan & Feb 1930. Excerpts from “The Anarchist Encyclopedia,” ed. Sébastien Faure 1934. The Sacred Conspiracy, Georges Bataille 1936. Anarchy and its Heroes, Cesare Lombroso 1897. Manifesto of the Anti-parliamentary Committee, Paris 1910. Anarchists have also contributed to the development of philosophy in the 20th century. See the Georges Palante Archive, for example. Both communism and anarchism, as revolutionary currents in the working class, have their origins in the struggles of the working class itself, not just in the writings of its leaders. The following episodes of revolutionary struggle are crucial to understanding the origins of both communism and anarchism. In 1871, with Paris surrounded by Prussian troops after France had capitulated, the workers of Paris rose up and seized power. This was the first time in history that the working class had seized state power. The ideas of Proudhon and Blanqui were the most widespread theories of revolution known to the Paris workers, but the International Workingmen’s Association actively participated through its Parisian section. The Commune was eventually overthrown by a reactionary army raised in the countryside and workers were slaughtered. Blanqui was elected President of the Paris Commune, but remained in prison throughout. 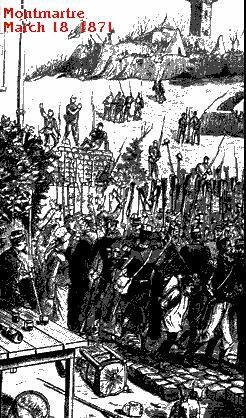 The Paris Commune was the testing ground for revolutionary theory, and in the light of its experiences Marx revised his theory of the State, concluding that the working class had to smash the state machine, rather than hoping to take it over or leaving it intact. The Civil War in France by Karl Marx. During the last decades of the 19th century the socialist movement progressed well while anarchism became marginalised and generally reduced to terrorism and sabotage. However, while tranforming itself into vast working-class parties, the socialist movement also became somewhat “respectable”. The conflict between Rosa Luxemburg and Eduard Bernstein and between Lenin and Kautsky illustrate the divergence between reformist and revolutionary wings of socialism. Doctrinaire socialists such as Henry Hyndman also criticised the mass socialist parties from the left. At the same time, a dynamic new movement grew in the working class, particularly in the trade unions, which merged features of Marxist theory with the best traditions of anarchism. This current became known as Anarcho-Syndicalism. Participants in this movement included both anarchists and Marxists, and others somewhere in between. Anarcho-syndicalism was especially strong in the English-speaking world where the trade union movement had its own traditions independently of the political parties and in Spain and Italy, where anarchism had a long history among the peasantry before the advent of anarchist theory in the workers’ movement. The founders of Anarcho-Syndicalism in the English-speaking world were socialists before they were anarchists, and looked to Marx not Bakunin for their theory. However, their focus on the independent development of the trade unions and their suspicion of parliamentarians provided the stimulus for the development of the vibrant and anarchic Industrial Workers of the World. Rudolf Rocker, a German immigrant to the U.S., is generally regarded as the founder of syndicalism, the doctrine which emphasises the role of the trade unions as vehicles of working class power and rejects the use of party-political organisation. His history of anarchism and anarcho-syndicalism is an excellent resource for the anarchism of the early 20th century. The IWW was a powerful movement that engaged both socialists and anarchists in the early years of the 20th century, especially in the English-speaking world. Among Marxists who fought against Anarchism and Syndicalism within the unions were Eugene Debs and Daniel DeLeon. American socialist, co-founder of the IWW and a leader of the left-wing of the Socialist Party. Solidarised with the Russian Revolution, but did not join the Communist Party. Brief Biography Eugene V Debs. Among the Marxists who fought against the syndicalist anti-party disposition of the workers, and in favour of the formation of a socialist party, in the early 20th century was John Maclean. Maclean argued for a single revolutionary socialist party and was made Soviet Consul in Scotland after the October Revolution. After the Russian Revolution, the Communist International recognised the I.W.W. as the representative of the most militant sections of the working class in the English-speaking world, and made a decisive effort to enlist the I.W.W. in its ranks. Many of its leaders, such as Eugene Debs, Big Bill Haywood and Jock Garden joined the Communist International and were instrumental in founding the Communist Party in their own country. There was another wave of IWW recruits to the Comintern during Stalin’s "Third Period" in the late 1920s. England: When the Anarchist International held their Congress in London in 1881, the four English delegates who attended were not actually anarchists and listened in silence. Until the 1960s, anarchism, in the forms known on the Contintent, never took on in England; the English anarchists were either anarcho-syndicalists or better described as ultra-left or anti-parliamentarian socialists. The Social Democratic Federation split between pro- and anti-parliamentary groupings, and Joseph Lane was an archetype of the English anti-parliamentary socialist agitator, and people like William Morris, Frantz Kitz and Sam Mainwaring were sympathetic to his position. Later on, people like Sylvia Pankhurst and Kate Sharpley, supported the Russian Revolution, but rejected participation in Parliament. See also the Communist Left Subject Archive. “In 1906, the Confederazione Generale di Lavoro (CGL) was formed to centralize and control the local Chambers of Labor. Six years later, in 1912, the Unione Sindacale Italiana (USI) broke away espousing anarchist-inspired syndicalism. By 1919, it was fairly sizeable though dispersed through multiple regions. Despite attempts at worker control and self-governing, World War I and the more reformist CGL prevented the USI from every really consolidating its strength. In the early 1920’s fascism came along and it saw to anarchism’s decline. Anarchism has a long history in Russia dating back to Bakunin and peasant struggles against the Czarist autocracy and the landowners. Particularly during the Civil War, after the Russian Revolution of 1917, substantial anarchist movements grew up, and found bases of support both in the Russian working class and particularly amongst national groups fighting for their independence. Strangely enough, it was Mikhail Bakunin who can be credited with introducing Marxism into Russia. Through Narodnya Volya (People’s Will) he recruited Georgi Plekhanov, widely recognised as the "father of Russian Marxism", teacher of Lenin and Trotsky. The Narodniks advocated secret society terrorist methods of struggle reminiscent of Louis-Auguste Blanqui. Although the Narodniks pre-existed Bakunin, his supporters would become its main force. Later, Bakunin’s supporter, James Guillaume, recruited the Russian emigré Prince Petr Kropotkin (1842-1921) to anarchism. (Anarchism of the libertarian variety has a long history of support in the Russian aristocracy, counting Leo Tolstoy among its numbers.) Kropotkin was the most prominent anarchist of the years leading up to the Revolution, but he is not a significant figure for the anarchism of the post-revolutionary period. Makhno Nestor (1884-1934), a leader of the anarchist armies which fought against both the Red Army and the invading White Armies, is probably the most famous of Russian anarchists of the time of the Civil War. Victor Serge, an anarchist who was deported to Russia by France in 1918, became Assistant Secretary of the Communist International under Zinoviev and made great efforts to reconcile the anarchists and the Bolsheviks until the rise of Stalin made such a project impossible. 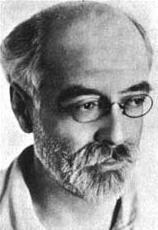 Serge was the last member of the Left Opposition to leave the Soviet Union before the Moscow Trials led to the execution of all Stalin’s opponents. ¤ Volin (1882-1945) served under Makhno, later lived in Berlin and then Paris where he collaborated with Sébastien Faure. 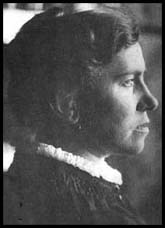 One of the most important anarchists of post-revolutionary Russia was Emma Goldman, whose political life spanned the I.W.W. activities and the anti-conscription fight in the U.S., Soviet Russia and the Spanish Civil War, in whose cause Emma Goldman gave her life. William Morris: Socialism and Anarchism, 1889. Plekhanov: Anarchism and Socialism, 1895. See also Fredy Perlman Archive. A democratic republic was formed in Spain in 1936, but Franco assembled a Fascist Army in Morrocco and with the aid of Mussolini and Hitler, waged a civil war which overthrew the republic and established a fascist dictatorship. Workers came from all over the world to fight alongside the Republicans in the International Brigades. However, following the triumph of fascism in Germany, Stalin and the Spanish Communist Party were more interested in avoiding revolution in Spain than in defeating fascism, so as to appease “democratic imperialism”. As a result, the Soviet Union used its forces to split the revolution, and Franco faced Stalinists, Trotskyists, “Centrists” and Anarchists who were unable to form a United Front. Anarchism had a long history in Spain, going back to the 1830s, with a strong syndicalist movement among the workers. The main anarchist force in Spain was the C.N.T. (National Confederation of Workers). Sydney Libertarianism was one example of anarchistic and libertarian currents found in urban centres around the world. See Documents from this current. Force! The Only Defense Against Injustice and Oppression, by C.S. Griffin [Jan. 13, 1885] Leading Chicago English-language anarchist spokesman C.S. Griffin offers this short defense of the use of violence in the social revolution. Griffin proclaims the “ vigorous use of dynamite” to be both “ humane and economical.” “ It is clearly more humane to blow ten men into eternity than to make ten men starve to death,” Griffin declares, adding that “ When ten men unite to starve one man to death, then it is humane and just to blow up the whole ten men.” Griffin asserts that “ A system that is starving and freezing tens of thousands of little children, right in the midst of a world of plenty, cannot be defended against dynamiters on the ground of humanity.” He adds that “ If every child that starves to death in the United States was retaliated for by the execution of a rich man in his own parlor, the brutal system of wage-property would not last six weeks.” “ The privileged class use force to perpetuate their power, and the despoiled workers must use force to prevent it,” Griffin says. The Black Flag! The Emblem of Hunger Unfurled by the Proletarians of Chicago [event of Nov. 27, 1884] Lengthy and detailed first-hand journalistic account of the march of 3,000 “Social Revolutionists” (Anarchists) through the streets of Chicago, published in The Alarm. The Social Revolutionists made use of the Thanksgiving holiday as an organizing device to protest the unemployment and poverty held to be an intrinsic part of the current social and economic system. Included is the full text of the organizing leaflet, produced by a self-described “Committee of the Grateful” of the anarchist International Working People’s Association, as well as excerpts of the speeches of Albert R. Parsons, C.S. Griffin, and Samuel Fielding, banner slogans, and resolutions adopted by acclamation by the demonstration’s participants. According to leading participant August Spies, this demonstration marked the first time that the black flag, the “emblem of hunger and starvation,” had been unfurled on American soil. The ecumenical nature of the Chicago Social Revolutionary movement at this juncture is reflected by the three cheers given for “our comrades the Anarchists of France and Austria, the Socialists of Germany, the Nihilists of Russia, and the Social Democrats of England.” A brief move by some to sack the mansion of Elihu Washburn, US Ambassador to France during the Paris Commune, was turned aside by calmer participants. Also included is an account from the Chicago Tribune describing the new anti-street riot tactics in which the National Guard was training in Chicago.